You can create an SSIS package that executes the Backup Database Task with Biml using only a few lines. As a helpful reminder, all of the database maintenance tasks are going to require an ADO.NET connection manager. Right click on that script, after adjusting the connection string, and you should end up with a package like this. This was helpful, thanks! 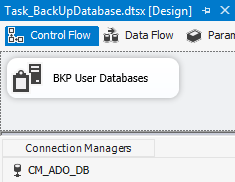 It may be worth mentioning the Backup Database task requires an ADO connection.